It wasn't too long ago that making the decision where to locate your scanning probe microscope was a simple one- put it in the basement where the ambient vibration was minimized. But recently, with nanotechnology applications growing exponentially, scientists and engineers are putting their equipment in a multitude of locations where vibration noise is significantly high. Additionally, in an effort to keep their nano-equipment costs as low as possible by cutting out the peripherals, many academics and industries are not adequately providing for vibration isolation on their ultra-sensitive nano-equipment that they are putting into their facilities. Although high-budget installations typically incorporate adequate vibration isolation, this is not the case with many lesser-budget set-ups (those spending under $120,000 for equipment), which represents the area of most rapid growth in the nanotechnology universe. It is estimated that 40 -50% of these sites, in both academia and industry, are initiated with inadequate vibration isolation. The vibrations are usually very subtle. What you will not feel with your hands or feet would cause considerable noise and disturbance to an AFM or interferometer. The noise is caused by a multitude of things, it is not just originating from one spot. Every single building is making noise. Depending on how high up off the ground you are, and how old the building is, you are going to get a constant vibration. Within the building itself you have things that are going to create even more vibrations, such as the heating and ventilation system, fans, pumps that are not properly isolated, and elevators. These mechanical devices create a tremendous amount of vibration in the building, and depending on how far away the instruments are from it, they may or may not be adversely affected. External to the building, your equipment may be influenced by vibrations from adjacent traffic, wind, construction, and other elements. An isolator is used to solve a problem, and how bad the problem is determines the solution you need. Since the 1960'sairtables have been used for isolation. Basically cans of air, they are still the most popular isolators used. But, air tables with resonant frequencies at 2 to 2.5 Hz can typically only handle vibrations down to about 8 to 10 Hz, not quite low enough for optimum performance with modern nano-equipment For clarity in scanning probe microscopes and interferometers, air tables are an inefficient isolation solution. The air systems have been adequate up until a few years ago when better isolation was required. As some may recall from the early years of nanotechnology, research scientists were fond of suspending their very expensive AFMs from bungee cords hanging from the ceiling, and sustained acceptable vibration isolation. Although some are still employing this technique, these numbers are dwindling - many aren't willing to take that risk any longer, and have switched over to other isolation systems. However, if you can get things mechanically isolated without having to use energy, such as electricity, then you are inherently better off. If you don't have to have some form of supplied energy to run your isolator, then you will not be so negatively influenced by problems of electronic dysfunctions and power modulations, which can interrupt scanning. 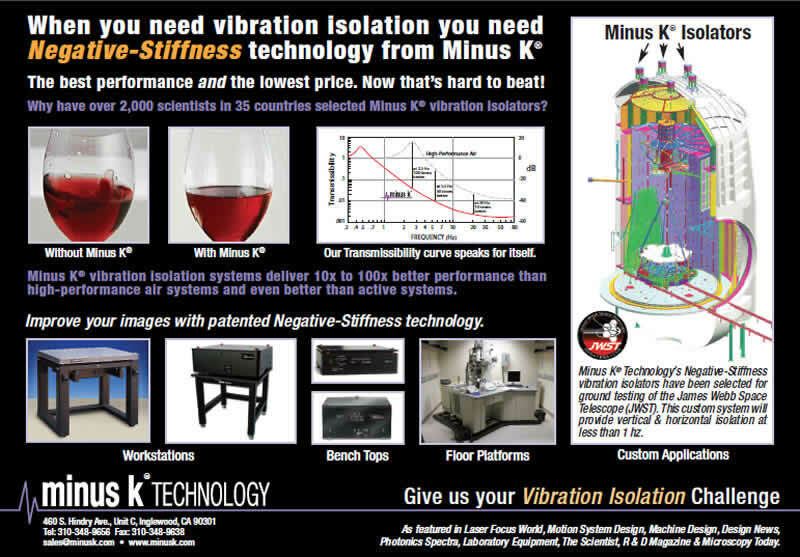 Negative-stiffness vibration isolation systems have become a growing choice for nanotechnology applications. Not only are they a highly workable vibration solution, but their cost is significantly less - up to one-third the price of active systems-making it an economical solution to cost-conscious administrators. Figure 3: Schematic of a negative-stiffness mechanism vibration isolator. A vertical stiffness adjustment screw is used to regulate the compression force on the negative-stiffness flexures. A vertical load adjustments screw raises or lowers the base of the support spring in response to varying weight loads to keep the flexures in their straight, unbent operating position. Negative-stiffness isolators employ a unique and completely mechanical concept in low-frequency vibration isolation. Vertical-motion isolation is provided by a stiff spring that supports a weight load, combined with a negative-stiff-ness mechanism (NSM). The net vertical stiffness is made very low without affecting the static load-supporting capability of the spring. 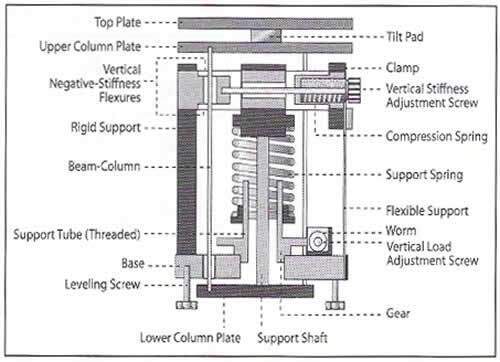 Beam-columns connected in series with the vertical-motion isolator provide horizontal-motion isolation. The horizontal stiffness of the beam-columns is reduced by the 'beam-column' effect (a beam-column behaves as a spring combined with an NSM.) The result is a compact passive isolator capable of very low vertical and horizontal natural frequencies and very high internal structural frequencies. The isolators (adjusted to 0.5 Hz) achieve 93% isolation efficiency at 2 Hz; 99% at 5 Hz; and 99.7% at 10 Hz.